As a member of a municipal water department, you’re all too familiar with the problems stormwater can present. Whether it's damage to infrastructure, flooding, erosion, pollution, I&I or overburdened treatment plants, there's no shortage of reasons for a city to plan ahead and prepare for increased stormwater flow. Municipal Sewer & Water has talked to hundreds of utilities and workers over the years, and many have shared unique stories or tips for managing stormwater. Here are a few stormwater stories we’ve heard recently. The city of Tallahassee (Florida) Stormwater Management Group, which formed in 1987 as a result of a losing hand dealt by topography and weather. Tallahassee ranks ninth-rainiest in the nation and second-rainiest in the state. Rolling hills, clay soils, and elevation changes of up to 200 feet exacerbate runoff. Some neighborhoods built before stormwater and land development regulations were enacted are in flood-prone areas. Today, 86,000 residential and 8,500 nonresidential customers pay a monthly $7.95/ERU stormwater fee. From the onset, the department focused much of its energy and money on alleviating flooding. To date, the city has spent in excess of $125 million on 150 citywide stormwater projects that have protected more than 750 properties. One project involved a 129-acre residential community bisected by an eroded clay-lined control channel. “More than 40 properties flooded, and residents occasionally had to be evacuated by boat,” Cahoon says. The canal, conveying runoff from a 3,400-acre urban watershed, produced velocities of more than 10 feet per second. A roadway adjacent to the canal was threatened by flooding and undermining. To alleviate the problems, the contractor stabilized 1,530 feet of canal with gabion baskets and reno mattresses (Maccaferri Group) and underlined them with woven geotextile material (TenCate Geotube). Workers also used steel sheet piling to stabilize an additional 1,520 feet of channel. The $6.27 million project also included a large secondary drainage system retrofit, and relocating more than 800 feet of utility lines and a 42-inch sewer. Durham, North Carolina, has no small challenge when it comes to managing the community’s stormwater. The city has to do more than just make sure the rain gets out of the way. It’s also charged with keeping the runoff from polluting local drinking water supplies — the same bodies of water to which the stormwater returns. Durham has taken a two-part approach to its stormwater battles. One part consists of an array of big projects and some experimental strategies that the city and its stormwater utility are using to help ease the flow of runoff. The other part consists of enlisting community residents to take on small projects in their own backyards — or front or side yards for that matter. 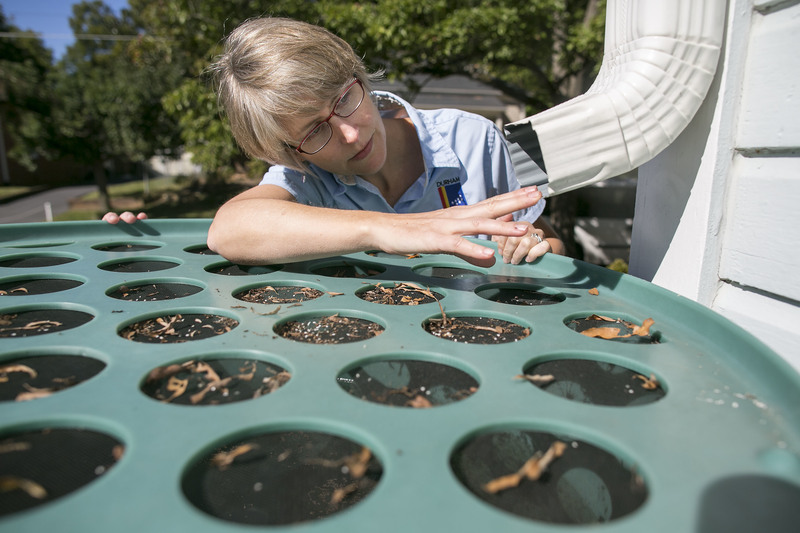 By encouraging, educating and supporting property owners in the simple, home-based projects, Durham’s stormwater utility can more effectively focus on its own bigger projects, says Laura Webb Smith, public education coordinator for Stormwater and GIS Services in Durham’s Public Works Department. Still another approach has been regenerative stream conveyance, a technique that Durham has been exploring in collaboration with North Carolina State University. A drainage channel near the city’s public works operations center is a test site for that sort of work. Water flows have eroded the stream bed and damaged vegetation in the area, leaving steep banks and reducing the ability of the area to absorb nutrients, which instead get sent downstream where they aren’t wanted. To slow down the stormwater and protect the stream banks, the utility is putting rocks in the stream bed, planting native vegetation and scattering small pools filled with mulch and sand in the area to further soak up water in hopes of reducing both nutrient pollution and erosion. The city manages contracts with outside firms to handle construction needs, including this pipe replacement project initiated by a weathered steel pipe that led to a sinkhole. Imagine a winding, switch-backed highway, running along a picturesque canyon down to a bluff overlooking the Pacific Ocean. Now picture a major rainstorm creating landslides along the canyon wall, soil and debris piling up in the canyon bottom, and water overflowing and taking out whole sections of the roadway, destroying access to critical neighborhoods and government facilities. That’s the scenario that prompted the Department of Public Works in Rancho Palos Verdes, California, to spearhead an award-winning project that now protects the San Ramon Canyon by diverting storm flow into a series of pipes that discharge through a new outfall structure into the ocean. At the same time, the project has restored the canyon’s original bottom elevation and rebuilt portions of the roadway. The project called for tunnels through unstable soil, featured a crane that lowered workers and materials over the bluff bank, and an ocean outfall sculpted and colored to match the bluff. In addition, the project was completed under budget and was executed with minimal traffic disruption. The fix presented a number of challenges, including financing, soil conditions, and design and construction of a new outlet structure on the beach, but all were solvable. 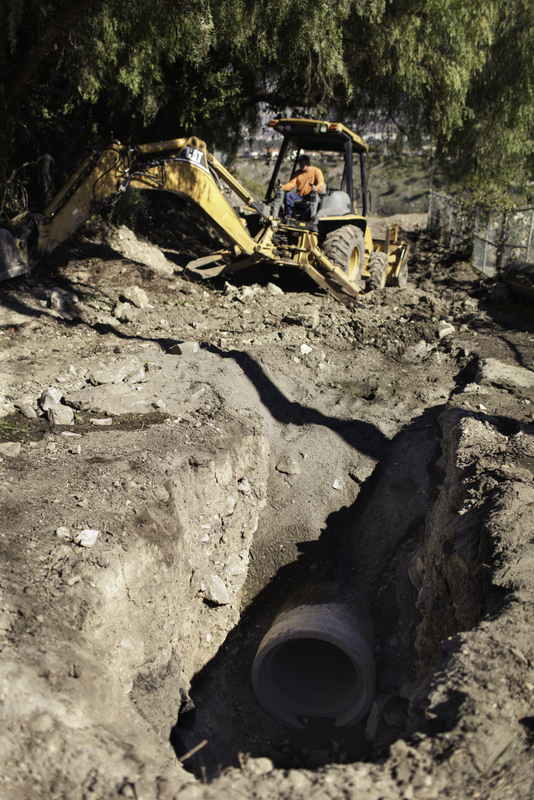 At a projected cost of $19 million, the San Ramon Canyon Storm Drain project was the biggest the city has ever tackled from a financial standpoint. In fact, Winje points out, the cost nearly equaled the city’s entire operating budget for a full year. The solution lay in securing a $9.5 million reimbursement grant from the state’s Department of Water Resources and paying the balance out of the city’s cash reserve. No debt was incurred. Even a “normal” rainstorm can dump a lot of water on the San Francisco Bay Area. The Richmond Municipal Sewer District recently invested $18 million in a storage system to hold much of that water, and keep it out of their treatment plant. It was pushed on an aggressive timeline. The district used a design-build approach to facilitate the project. Carollo Engineers, the city’s design-build contractor, prepared a number of construction packages that were publicly bid to ensure the lowest cost for the project. Construction began in June 2014. The RMSD wet weather storage facility, completed in September 2015, has a 5-million-gallon capacity. During a rain event, wastewater is diverted when the flow at the treatment plant exceeds 40 mgd. When the plant returns to a normal flow rate, water held in the facility is directed to the plant’s influent lines for treatment. The system includes a diversion box, pump station, pipeline and an above-ground circular prestressed concrete tank approximately 150 feet in diameter and 53 feet tall. The tank is located near the treatment plant. It is covered for odor containment, to reduce algae growth and keep out insects and birds.